The 3D community has a new CPU, GPU and CUDA benchmark suite to play with. Time to test your machine on the Blender Benchmark. 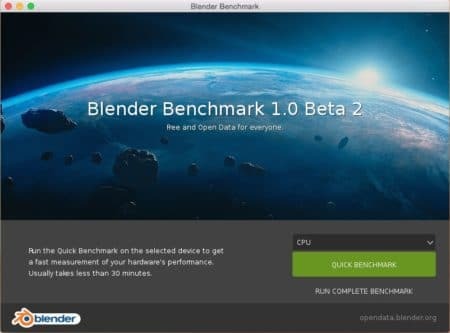 The folks behind the open-source Blender 3D modeling, renderer, and animation software package for multiple desktop operating systems has produced a new benchmarks suite that is currently in beta. It is available for download and uses now but being in beta means it is far from being truly stable. “Blender Benchmark is a new platform to collect and display the results of hardware and software performance tests,” says the description at its website here. The goal here really is to assist developers and track performance during Blender’s actual development. Having comparisons between systems and installations will be useful. 01 – Blender Benchmark is a new computer performance benchmark testing suite aimed at the 3D software market professional. The Blender Benchmark will compute performance for CUDA, OpenCL, and CPU, along with GPU performance. Your data from your system tests can be shared (and ideally is shared) anonymously with the Blender Open Data platform. The current fastest GPU is the NVIDIA Titan V, while the current fastest CPU is the AMD EPYC 7551 32-core processor, a chip aimed at server platforms. To download the beta benchmark suite now click on the link here. A few words of caution, given that we naturally explored this a few times prior to writing this article. Firstly, this is a beta and the benchmark suite did crash on us a few times on a machine running macOS El Capitan. That is version 10.11.6. We were more successful with macOS Yosemite (10.10.5) which is ironic and we will test soon newer machines we have explore on. The quick test is recommended as the test is anything but really quick. This test is not as fast as other benchmarks like the one from Maxon (Cinebench). So plan on giving up your machine for a bit to run this test suite.